While we work on new courses you can pre-order them. When you pre-order you get instant access to released courses. You also get over 2 hours of new video training every week until all the courses are released. It’s all automatic. Lessons will automatically download to your computer when we upload new lessons to our server. Sign up for our newsletter to stay up-to-date on course releases! Note: USB’s ship when the last course is released. All courses have been released!!! Note: USBs ship when the last course is released. Come back soon for updated information. 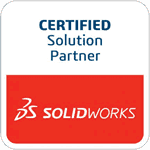 Release of the SolidWorks 2019 Training Courses is on hold. They will be released this summer.